Tens of thousands of Red for Ed supporters marched on the Capitol last week, and they say they'll stay out of schools until Gov. 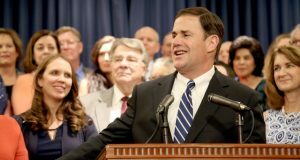 Doug Ducey and the Legislature come up with a plan for education that satisfies them. Arizona House and Senate leaders have reached a deal with Gov. Doug Ducey on a plan to fund his proposal for a 20-percent pay hike for teachers, but they won’t disclose how they’ll pay for it. The Arizona Education Association is mulling a ballot measure that would ask voters to find the revenue for increased education funding in their own pockets – one way or another. Arizona Democratic leaders oppose a sales tax hike to provide new revenues for teacher pay raises, despite supporting sales tax increases in previous years. House Majority Whip Kelly Townsend, R-Mesa, is telling teachers who oppose the job action to send her emails at her official state address detailing that they actually want to go to work but can't because the school has been closed. Townsend told Capitol Media Services she will write back -- and from her official state email account -- to provide proof that they made that claim.